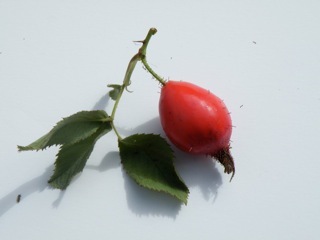 The seed capsule of the rose bush variety called Rosa rugosa, which produces the largest rosehips fruit. 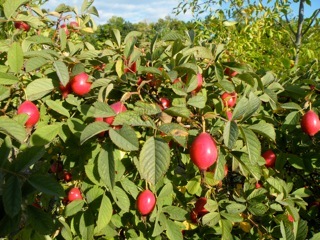 Ripe rosehips from the variety Rosa rugosa start ripening in late August and are ready for picking in mid September in Zone 5a. About 80% of the rosehips ripen at the same time. However if picked as they ripen most of the crop can be harvested. 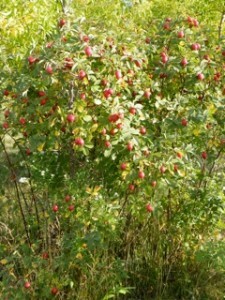 Though some rosehips are left for wildlife, the critters around here do not bother the fruit much. 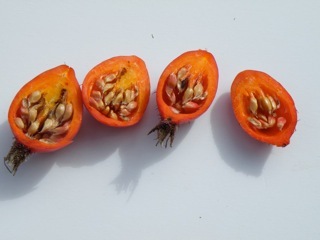 The seeds are very hard, and only the outer red fruit casing is edible. It takes some work to clean the fruit of tiny hairs and the tightly packed interior seeds. The fruit is very tasty with a flavor that resembles apples and is well known for its high Vitamin C content. Today the seeds are pressed for an oil that is nutritionally valuable. These rosehips are from the variety Rosa rugosa which has a reputation for producing the largest rosehips which can weigh up to 10 grams each. All are cut into about the same size pieces and then placed into an electric dehydrator. If dried on medium heat and out of the sun then sealed in glass jars, stored in cabinet away from light, they hold their color up to two years. If dried in the sun they turn dark brown or black. Once they lose their color they also lose their Vit. C. Generally herbs and dried fruits kept this way are good up to three years, some much longer. 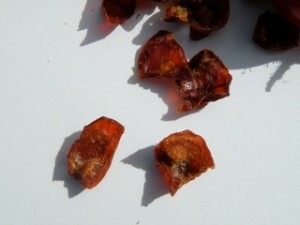 Dried rose hips need longer to plump up if used as a tea or mixed in with other herbs. 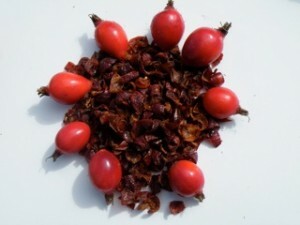 It is best to steep the rosehips pieces in hot water for 20 minutes, depending upon size. Then strain and add the liquid to whatever herbal tea blend desired. Rosehips make a wonderful fruity tea mixed with fermented blackberry leaves, chamomile, red raspberry leaves, and nettle. See recipe section. Close up of the rosehip. 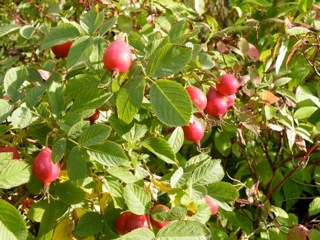 The rosehips I collect come from the hedge rose variety Rosa rugosa. My first bushes were purchased from Jung’s in Randolph WI in the late 1970s. Those did well the first two years but I had planted them at the edge of my garden in heavy clay soil. After losing several bushes to powdery mildew I transplanted the one surviving bush to a better location, in a nearby field where spreading and drainage would be no problem. Over the decades since then at least a dozen new bushes have sprung up around the 9 acres of open field. New bushes show up every year almost any place on our homestead from flowerbeds to fields. I’ve been very happy with this variety once I understood its needs in this location. I’ve never planted the seeds to see if they would grow, but if I did they would get planted in fall as I suspect they need the variations of cold and moisture characteristic of this climate in order for the tough seed covering to open. It is obvious that seeds being dropped randomly is the main propagation method here, I just can’t take credit for it. Deer have kept the mature bushes trimmed but it doesn’t seem to have bothered the bushes rather they don’t get as tall. 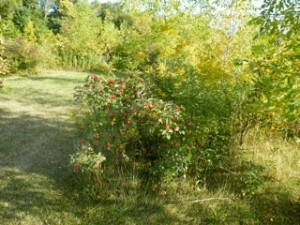 One of the oldest bushes didn’t suffer any deer damage as it was in an elderberry patch. The deer never bothered anything in there. This old rugosa bush grew at least 6 feet tall before it and the elderberry bushes had to be cut for a new home site. 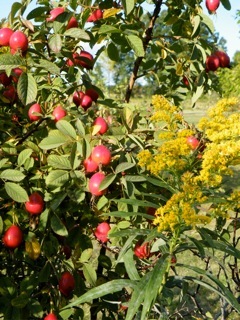 But, every year, by the time the heavy load of rose hips fruit was ripe the branches bent low enough for easy picking. Low growing fruit, mostly on younger bushes, is sampled by critters including turkeys. But as the bushes mature most of the fruit grows high enough to be picked without much bending. Younger bushes need to be protected with chicken wire cages until they grow high enough and bush out enough so that wildlife doesn’t severely damage them. Wildlife browsing does help keep them in check as this variety spreads readily from the base plant and will make a dense thicket or hedge in 5 to 8 years. Mowing the young shoots will also control the spread. The foliage is beautiful, almost blue green in spring, with a dense graceful drape. The brilliant ripe fruit shows up easily near the branch tips, ripening mid to late August in east central Wisconsin (Zone 5a, with winters occasionally dipping from –20 to –30F degrees). Though the foliage, pink fragrant flowers and brilliant red orange hips make the Rosa rugosa variety very attractive, it needs space, and some seasonal attention. done after picking the fruit in fall before the leaves fall or before the leaves open in spring. I haven’t taken notes to be sure. a lovely companion plant and it blossoms when the rosehips ripen making a pretty picture. The burdock is kept cut but allowed to grow somewhat as its deep root brings up nutrients that are available to the rugosa once the root dies and decays. The Red Osier dogwood however likes to edge its way in the mix as well. This very aggressive native species must be vigilantly cut out however or it will crowd out the Rugosa. I cut back the dogwood branches but don’t try to uproot it until late fall or early spring to not interrupt the fruiting season. to deep red color. For best flavor they should be picked while still hard but before turning dark red, ideally when red/orange. Once they pass the red-orange color the flesh becomes mealy rather than crunchy. It’s still useable but not as flavorful. In many rose varieties the hips are small, and often round. The Rosa rugosa variety however is renowned for it’s huge hips. 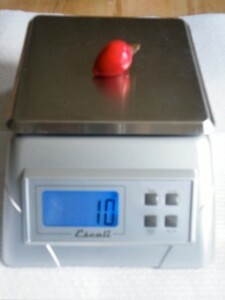 The fruits weigh from 0.2 to 0.4 oz each, or for field estimating 7 for 2 ounces, or 56 per pound. In metric measures, in 2009 the largest one weighed 10g, with many weighing 9 grams each. They measure 21 to 26mm at widest portion by 27 to 37mm in length, fruit only, or about 1 inch by 1 5/16 inch. Though hardy some of the problems that can affect Rosa rugosa are powdery mildew (not shown, but it’s a grey dusty coating on the leaves), wildlife damage (bites out of young fruit causing it to grow deformed, see photo, insect larvae developing inside (not shown), and a scab like texture resembling apple scab (see photo). Powdery mildew occurs with hot day time temperatures followed by cool, humid nights. The Rosa rugosa bushes that do best during this type of weather are those growing under young trees or in light shade, and around which we mow to keep good air flow. This variety of rose seems to only transplant well when under 2 feet tall and before it sets out leaves, in other words, fall after leaf drop, or early spring. We tried transplanting a large old bush that was in the way of putting in a mound system and it did not do well. 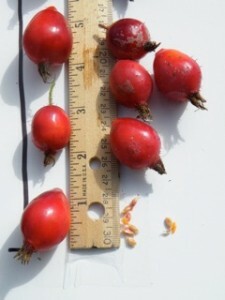 Rosehip seeds produce a valuable oil. However I learned that it takes a minimum of 5 lbs of rosehip seed to begin the process, far more than I plan to have. Given the time consuming work of cleaning the rosehips, for one person several bushes are plenty. But if a number of small growers pooled their seeds in a cooperative effort this could be worthwhile. Rosa rugosa produces flowers and rose hips at a young age. A three year old vigorous plant may show off several flowers and later hips. Several mature bushes can produce quite a bounty. Some people cook the rose hips whole until soft and then strain them through a cloth collecting just the juice. 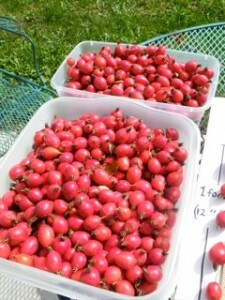 Others cook the rose hips until soft, then run them through a sieve to remove the seeds, then making jam or sauce. However cooking at high temperatures, as required for jam or canning juice or sauce ruins much of the nutritional value. I try to preserve as much of the food value as I can by using as little high heat as possible to still get a safe product that keeps well. For cooked recipes I prefer to use a product called Sucanat. It resembles brown sugar in appearance but the taste is more robust and interesting. To make it the sugar cane is cut daily, crushed and the juice is collected and heated to reduce it to thick syrup, which is stirred by hand as it dries to create the Sucanat granule. The sugar cane’s molasses is locked in giving it a rich distinctive taste while remaining a source of trace minerals and iron. It is usually available where organic food products are sold. Organic sugar or regular sugar may be used in a 1:1 replacement. Given the huge problems with excessive amounts of refined sugar I choose to avoid it as much as possible. Conventional jam recipes use amounts of sugar that are almost equal to or exceed the amount of fruit used. There’s got to be a better way. Even using honey doesn’t cut it, in my mind, as high heating of honey ruins its nutritional value. So I continue to experiment with methods that are most gentle to the nutritional value of the food being preserved. 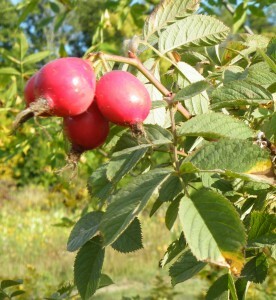 Rose Hips have a unique crunch and a mild apple taste when fresh. Cooked they have a delicate flavor which is not as strong as that of the Sucanat but the combination is delicious. If the preserves are to be consumed shortly after preparation then a bit of spice may be added, such as ginger or cinnamon. Spices fade in frozen foods so it’s best to add them after thawing and before serving. spooned over sliced bananas, or rice pudding, or tapioca for a simple dessert. Also try the rose hips preserves as the filling in layer cakes, or heat with some rice vinegar, blending into a smooth sauce and use as a dipping sauce for egg rolls. Put rose hips into a large bowl and add cold water to cover. Using hands agitate the fruit, and massage them gently, for several minutes. Rose hips have tiny prickly hairs that easily come off when rubbed gently in cold water. They can irritate the skin so vinyl gloves might be a good idea although the prickly hairs are easily rinsed off the hands. Rinse the rose hips and repeat this process two or three times, until the water is fairly clear. Some prickly hairs will remain on the fruit. They cook down soft and don’t interfere with eating. However, if eating several rose hips raw these prickly hairs can cause the throat to feel dry. So rub them well with a soft cloth or glove to remove the hairs before eating raw and chew them well before swallowing. It’s very important to remove the seeds as they are hard as stones and may cause tooth damage if accidentally bit into. Seeds may be used as wildlife food, or ground (use a seed grinder) for use in recipes. I’ve not used them in any way except to sprinkle sparingly on hot cereal. 1. Rinse the cut up rose hips quickly to get any missed seeds or debris out. 2. Put into heavy saucepan (not aluminum or copper as these diminish Vit. C content). 3. Add water just to cover. They float so keep that in mind. 4. Bring to boil over medium heat stirring often. 5. Reduce heat immediately when the fruit starts to “pop and splatter”. uniformly soft and a mushy pulp. 7. Pour into a stainless or glass bowl. Quickly measure the quantity and return the soft pulp to the original saucepan. 8. To each 1 cup of pulp add 1/2 cup of Sucanat, organic sugar or regular refined sugar. Or use 1/3 cup of mild flavored honey. Strong honey such as buckwheat, or other syrups such as maple or sorghum may be used but the strong flavor will over power the delicate apple like rose hips flavor. This is fine if the aim is preservation more so than flavor. 9. Return kettle heat to medium low and cook for 5 more minutes stirring frequently to make sure the Sucanat (or other sweetner) is well dissolved. 10. Prepare a cold water bath either in a clean sink or a large basin using either cold tap water or ice. Remove kettle when cooking time is done and place into cold water bath to cool it quickly. Heat a separate kettle with water to boiling to sterilize tools (large spoon and ladle). 11. Stir sauce occasionally to speed up cooling. Replace ice or cold water if needed. When pulp is just lukewarm (check with sterilized spoon), use sterilized ladle to dip the cooled pulp into clean plastic freezer boxes following the manufacturer’s directions. Usually the instruction is to leave 1/2 inch to 1inch headroom. If packed while still very warm condensation will form ice crystals on top of the sauce. So packing when at room temperature reduces that. 1 to 2 cup containers are suggested for family use. Spread out containers in freezer to promote quicker freezing. I’ve not made fruit leather out of rosehip puree, though I have made fruit leather out of pears and apricots. To make rosehip leather I would just cook the sauce down more, simmering on med low until so thick it mounds on a spoon. Another test is to scoop some up with a slotted spoon and note that no liquid runs out. Then spread it onto parchment paper to place into an electric dehydrator, or place the paper on a cookie sheet and into a low temp oven. My electric oven doesn’t heat at less than 170 degrees so when I dry fruit I use that but keep the door open. I’ve not dried rose hips fruit or leather this way. The only way I have dehydrated rose hips is using an electric dehydrator because this unit has better temperature control and the color retention for the rosehips is superb. Before drying the rose hips, after cleaning them, cut them into pieces one fourth to one half inch wide. The inside surface will have a bit of silvery sheen to it from the fine hairs but this is no problem. When dried this silvery sheen may resemble mold but it likely isn’t. Just be sure the dried rose hips are really dry before storing, and that they are not put away while still warm from the dehydrator. I’ve dried rose hips outdoors in full sun for a couple of hours and then finished them in the shade on a hot day. To do this I adapted a mini movable greenhouse using brown paper bags opened up to line the wire rack shelves. But the color of the rose hips darkened. The best results so far are with the electric dehydrator. I start the drying on high heat for no more than an 15 minutes and then go to medium reducing it to low as they get firm. I keep it there until the pieces are leathery hard but still have a nice orange red color. I live in a rural area that has reduced electric rates for off peak hours. This saves on the cost of electricity. Once stored the rosehips will retain the red orange color for up to a year. Dark red/brown rosehips have been dried using high heat, or heated too long, or not stored in a cool dark place, or are more than a year old. This doesn’t affect the flavor however. Anyone short on time or disabled here are some things I learned. Collect the rose hips and pour them into flat containers, like cut down clean boxes, no more than 4 inches thick. Place in refrigerator and take out as you can handle them. If they are solid and have no insect damage when collected they will keep well in the fridge for a week or in a cool room almost as long. Do not cover as condensation will start rot. Check the blossom end of a few in each box daily. If they are starting to soften or the blossom end has started to crack or soften when they are collected then they must be cleaned and preserved as soon as possible that day. Keep them cold. (In the wild, as survival food, the frozen mush fruit is still usable according to survival manuals. However here it turns brown and rots with the first frosts and when that remains in winter it doesn’t look very appetizing. If need be I’d cook these well or add to hot water and simmer for tea. Be aware there may be insects inside.) I’ve never found the rotting fruit, or frozen remains in winter, to smell other than like rotting apples. I’ve always wondered why nobody mentions the prickly hairs on the rosehips. Though these are quite bothersome, it’s temporary as they are easily rubbed off. They feel similar to thistle pricks but once removed don’t leave any residual pain like stinging nettles. Exposing bare hands and arms to the prickly little hairs is irritating and unavoidable. To avoid the irritation wear a long sleeved shirt of a heavier fabric like flannel or denim, and light garden gloves. Since I collect several gallons of rose hips each season I’ve had to come up with ways to deal with the prickly hairs or give up on working with large quantities of them. Remove the shirt when done picking and shake out well before laundering. Vinyl gloves are recommended for washing rosehips, if you have a lot to wash, and also for cleaning. 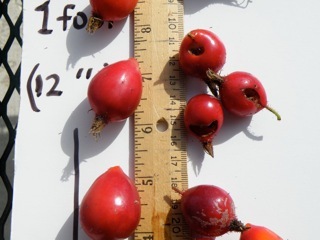 When cutting the rose hips, and removing the seeds, if not wearing gloves, have a large bowl of clean cold water close by to rinse hands and knife frequently. The rose hips are a challenge to cut through as the seeds are so hard they stop the knife. For a disabled person with hand limitations this can be frustrating. So blanching would be a best option then. 1. Collect the rose hips. Remove the dried black blossom end and stem. 2. Using a large kettle (4 to 6 qts.) fill half way with water and bring to boil. Reduce heat to keep it hot but just barely boiling. 3. Have large bowl of ice water handy. 4. Have empty cookie sheet or baking pans. 5. Working with small amounts of rosehips at one time, carefully place them into the hot water and stir. I like to work with enough to cover the surface and one layer below. 6. After three minutes remove the rosehips quickly with a slotted spoon and put them directly into the ice water bowl. Stir to chill as this stops the cooking action. 7. Remove with slotted spoon to clean flat pans. 8. Cover and put chilled rose hips in fridge until they can be worked with. 9. Cut in sections, remove seeds and put fruit aside for preserving. Rose hips may be soft enough to simply pull apart instead of cutting. 10. If working slowly fill small containers with the cleaned rose hips fruit and refrigerate them as you fill them, until all of them are done, before blanching. Then when done blanching do the final steps for your choice of preserving. After the above alternate “blanching” method of preparation is done then the partially cooked fruit doesn’t need as much to get it ready for freezing or drying. piece so the outside skin of the fruit is down and the piece curves up. This will make it easier to remove when dry as there is less surface contact with the cookie sheet. 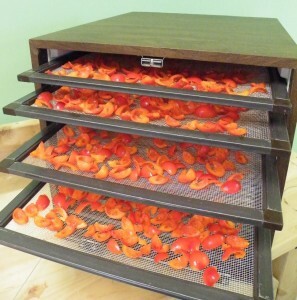 To use an electric dehydrator place the blanched fruit directly onto the screen trays. If the fruit is very soft it may stick to the screens. So check it during the drying process and turn if it seems to be sticking. I’ve never had it stick so bad that it was a problem. Fruits dehydrate often to tiny pieces. Keep the pieces long and narrow rather then square or round. They dry quicker and are easier to pick up. If using a conventional oven leave the oven door open for moisture to escape. Check oven temp to see if it will heat below 170 degrees. I like to use around 100 to 135 degrees which my old oven was able to do. 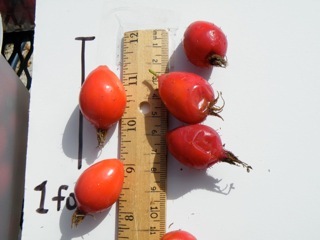 My new one doesn’t get below 170 degrees F. Rose hips will darken with storage but often keep their red orange color with lower heat dehydrating up to a year. NOTE: I’ve dried rose hips many times without prior blanching. Simply after washing and cleaning them, I’ve cut them up and placed them in my Excalibur dehydrator. I start on high heat to get the trays well heated and then cut back to medium finishing on low. They kept their color very well for up to a year. I’ve also taken the freshly washed rose hips, removed the blossom end, and then cut them up placing them in the dehydrator, seeds and all, and proceeded with drying them. These were used for tea. Sometimes I grind the dried rose hips and seeds before making the tea to hopefully extract the nutrients from both the fruit and seeds. When using the seeds, either whole or ground, I let the tea steep longer than if using just the fruit, pouring boiling water over all and then putting a tea cozy (or towel) over the tea pot while steeping. Boil one quart of water for 4 cups. Into a glass canning jar, pour one heaping tablespoon of dried rose hips pieces. 1 tablespoon of fermented dried blackberry leaves, and one tablespoon of dried alfalfa leaves. Pour over the boiling hot water, cover, place a heavy towel overall, and steep for 15 minutes minimum. Strain off the herbs and drink as hot tea. 1 tablespoon of nettle leaves.